New York Times bestseller John Lescroart returns with an ambitious, torn-from-today’s-headlines thriller featuring his trademark blend of real people and real suspense. John Lescroart’s millions of fans have been waiting three years for the return of San Francisco defense attorney Dismas Hardy and his buddy, detective Abe Glitsky—and in that time John Lescroart’s popularity has continued to soar. Now, Hardy and Glitsky reunite in a story filled with the big themes that are worthy of them—the intersection of love, betrayal, and a desperate search for the truth in a critical matter of national security. When Dismas Hardy agrees to clean up the caseload of recently disappeared attorney Charlie Bowen, he thinks it will be easy. But one of the cases is far from small-time—the sensational clash between National Guard reservist Evan Scholler and an ex-Navy SEAL and private contractor named Ron Nolan. Two rapid-fire events in Iraq conspired to bring the men into fatal conflict: Nolan’s relationship with Evan’s girlfriend, Tara, a beautiful schoolteacher back home in the States; followed by a deadly incident in which Nolan’s apparent mistake results in the death of an innocent Iraqi family as well as seven men in Evan’s platoon. As the murky relationship between the U.S. government and its private contractors plays out in the personal drama of these two men, and the consequences become a desperate matter of life and death, Dismas Hardy begins to uncover a terrible and perilous truth that takes him far beyond the case and into the realm of assassination and treason. 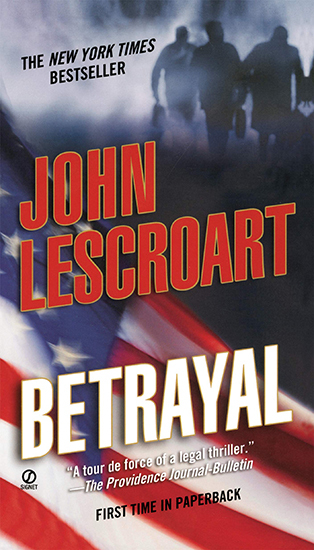 From the treacherous streets of Iraq to the courtrooms of California, Betrayal is not only John Lescroart’s most ambitious and provocative novel, it is a magnificent tour de force of pure storytelling.